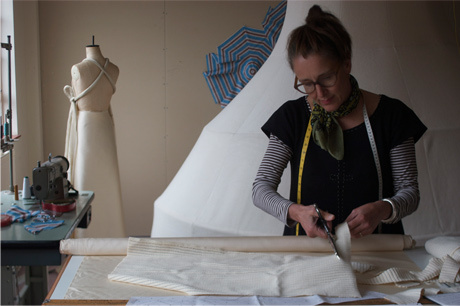 Tessa Brown is an artist with a background in bespoke garment construction. She has made garments and other functional objects out of cloth from a very early age, learning couture techniques and developing a love for cloth, from her mother, who graduated from the Royal College in the 1950s. Tessa made clothes for herself and others whilst studying for a degree in anthropology at UCL in the 1980’s. After graduating she established her studio, where she developed a reputation for making elegant sculptural garments for a range of clients, building long-term relationships. The maker-client relationship is necessarily a collaborative one, and many artist and designer clients have sought Tessa for her technical skill and knowledge of cloth. Her capacity to engage with the rigours of an artistic practice has in turn has led to artist collaborations, a selection of which are shown on this site. One of these collaborations, with sound artist Cathy Lane, resulted in Tessa developing a site-specific, textile-bound ‘gallery’ for listening. She has gone on to develop a series of other related structures, with the generic name ‘Tings’, which explore the capacity of cloth to affect one’s experience of a space. Tessa’s garment making practice continues as the critical research project UNIFORM and encompasses workshops and writing about our relationship with the woven and knitted stuff that fills our world, and how we use it to hide, reveal, comfort, protect, mask and frame our experience. She continues to make garments for herself as well as other clients.